I was in for a treat today. Actually it started about two days ago when I noticed a flash of red in my dogwood tree. I watched closely expecting to see a bright red cardinal, when in the same spot I briefly saw gray and white and thought I had seen a mockingbird. But it didn’t seem right to have seen the two different birds in the same spot so close together. As I continued to watch the mystery resolved itself. What I had seen was brief glimpses of parts of a much larger bird, the Pileated Woodpecker. 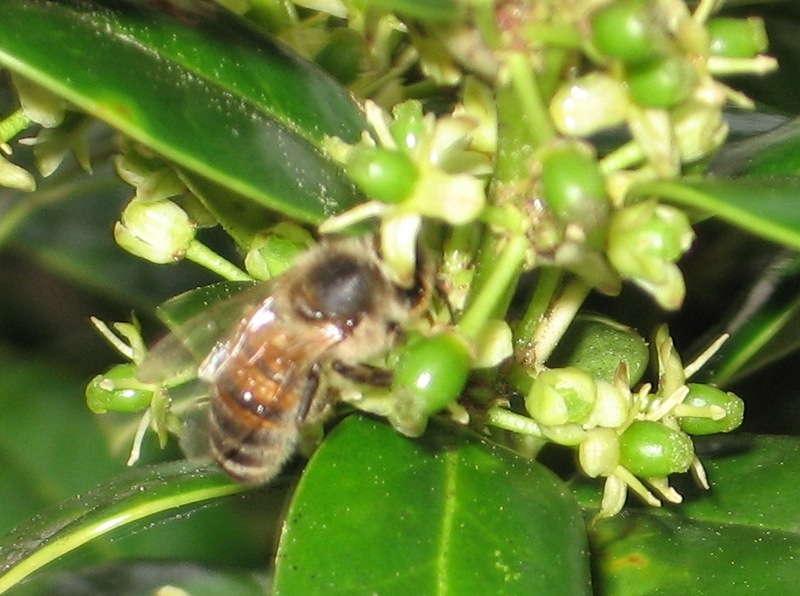 It was eating the red berries on the dogwood tree. Today I again noticed a large bird in the dogwood tree, though I couldn’t get a good look. So I retrieved my binoculars and began searching for the bird and found it. This time it was a Northern Flicker. I had commented to my husband only yesterday how we never saw flickers in our yard, only the Red-bellied Woodpecker which I used to mistake for a flicker. Then I began to notice robins which don’t come to our feeders. All of the birds were after the red berries. I then discovered a female Baltimore Oriole eating the berries as well as the Red-bellied Woodpeckers. All within about five minutes I saw a wide assortment of birds, three of which I had never seen at our bird feeders. But then, alas, the berries were all gone and the show was over. I went out in the rain to look closer, and sure enough, they had cleaned the branches of all red berries, though there were several lying on the ground under the tree. When the rain stops I may pick them up and put them in our feeders. I hung a suet basket near the dogwood hoping to attract some of the birds to it, especially the coveted orioles. I’ll be watching to see if the birds find it. We haven’t used that feeder for some time. The Great Backyard Bird Count has begun for 2009. This is an annual event hosted by the National Audubon Society and Cornell Lab of Ornithology. This is my first year to participate, but I am thoroughly enjoying it. Dave and I had noticed a new bird on our bird feeders within the past week and wondered what it was. With the help of their bird list of appropriate birds for our area and time of year, coupled with my bird hand book and their web site, I was able to identify this bird as a Pine Siskin. Here is a picture I took of my bird feeder. The Pine Siskins have speckled bars going up and down their heads and breasts. The American Goldfinch has a solid drab yellow colored head and breast. The Goldfinch’s bright yellow coloring will return later in the spring when their mating season begins. Can you find all eight birds in this picture? The Siskins and Goldfinches have flocked to our feeders in droves. It is very difficult to count either species when they are all mixed together and bouncing around, so I did my best to count everything to get a total count. Then I counted the species that seemed to have fewer numbers and subtracted that from the total. I also counted several Cardinals, a Red Bellied Woodpecker and a Downy Woodpecker, a Mockingbird that was standing guard over the territory even though he wasn’t eating at the feeders, Titmice, Purple Finches, White-Throated Sparrows, a Chipping Sparrow, a Towhee, and a Blue jay. Later Dave and I went walking and saw and heard 9 crows flying overhead so I turned in a second count for the crows. I encourage my readers to check out the Great Backyard Bird Watch on-line and either participate or check out the findings. See if anyone is posting for your community by selecting your state first. Have fun! I just have to say I’m constantly amazed at the number of different kinds of birds we have around our house and yard. Yesterday I saw another first for me–the Summer Tanager. It is a totally red bird–the color is almost psychedelic. At first I thought it was a cardinal but the color was a little different with no black around the beak and no crest on its head. Its wings were barely darker than the rest of its body but still red which tipped me off to look under tanager in the bird guide book. I saw the same bird again this evening. Both times, the bird was eating from the suet basket while hovering like a hummingbird. I also saw another visitor that I don’t see often this evening–the Indigo Bunting. I’ve seen them before, but very seldom. Then we had all the regular visitors: Blue Jays, Cardinals, Mocking Birds, Downy Woodpecker, House Finch, Chickadee, Red Bellied Woodpecker, Titmouse, Morning Doves, Eastern Bluebirds (in front yard). They love our bird feeders. I wish I was better at catching them with the camera. Our back deck is just outside our kitchen window. We have a table on the deck, but it has gone to the birds, so to speak. On the table we have potted plants and a bird feeder and water dish. Of course, this time of year the plants only serve to provide perches for the birds as most of them have died back for the winter. But the birds are very active this time of year. We are currently feeding American goldfinches, cardinals, white-throated sparrows, titmice, chickadees, blue-jays, mockingbirds, house-finches, wrens, and a downy woodpecker. 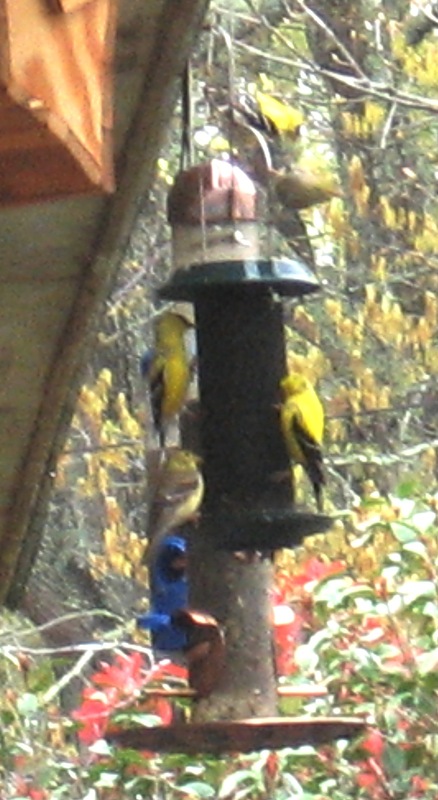 The goldfinches are not the bright yellow color that I remember enjoying as a child in Indiana. In the wintertime their feathers change to a dull brownish yellow, so that I almost didn’t recognize them. My bird guide helped me to confirm that these birds were indeed the goldfinches and their plumage was for the non-breeding goldfinches. I’ve enjoyed watching the birds through the seasons. We feed more black sunflower seeds than anything else, but we do keep several suet baskets filled as well. The first time we put out a suet basket I used a berry suet that was supposed to attract orioles. I saw what had to have been an oriole feeding on it within a day or two. At first I thought it was a robin because of all the red coloring, but then as I watched it I realized that this bird had more red than a robin and that the black seemed blacker. But sadly that was the only time I saw the oriole. It never came back. Early last spring we had a number of house finches at our feeder. I noticed one that had a serious problem with one of its eyes as it protruded abnormally from the birds head. The bird almost lived in the feeder and only left when the other birds chased it away. I took a picture of it with my digital camera to get a better look at it, and then realized that its beak was also malformed. 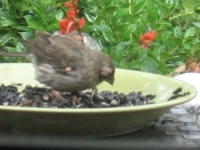 No wonder it stayed in the feeder, I’m sure it had to struggle to get the sunflower seeds out of the hulls. One day a storm was coming up as I was leaving for work and I knew the rain would fill the dish we were using as a feeder. I worried that our poor bird wouldn’t survive the storm, and apparently it didn’t as we never saw it again. Another time I was working in the kitchen when I heard something hit the window hard. 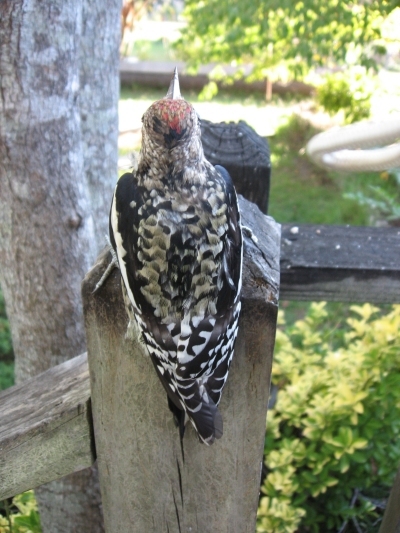 I looked out the window and found a woodpecker lying on the deck. I suspected that it had only knocked itself out and that after it came to, it would fly away, so I ran to get my camera. I tried to get it to perch on my finger but it didn’t catch on too well. 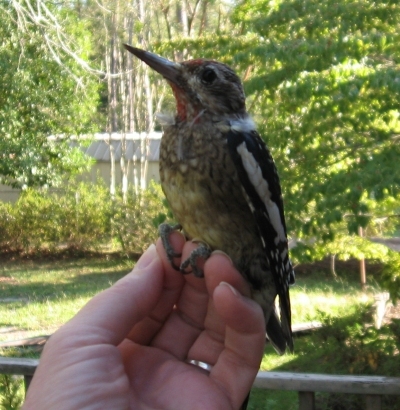 Maybe it was the way woodpeckers use their feet, but I was finally able to get it to perch on my fingertips like they were a stump. I eventually urged it to sit on one of the posts in the railing of our deck and took several more pictures before it gained its senses and flew away. I then went to my bird guide and learned that my woodpecker was really a male yellow bellied sapsucker. I never saw the bird again. The birds are very entertaining to watch. When they are feeding their young they get aggressive and it is like a king of the mountain game as they commandeer the bird feeder until they are satisfied or until they get sent on their way by a more aggressive bird. Bird seed seems pretty cheap compared to the amount of enjoyment we get from watching our birds out the window.